Kaikoura is a peninsula outcrop into the ocean about 3 hours north of Christchurch, and a popular little weekend get-away….and one on which we tried out our two-child-travel-technique recently. The shallow shelves of rock you see over the bluff were traditional Maori food collection spots–full of fish, crayfish, and paua (a one-sided shell fish). We walked the pathway around the peninsula the first day we stayed there. 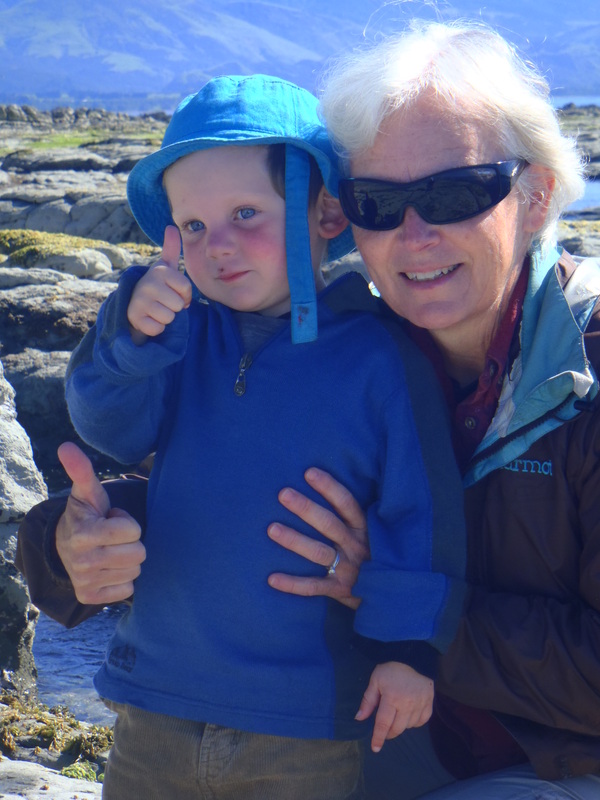 Jeremiah and I visited Kaikoura about a year ago and one of my favorite activities was poking around in the tidal pools. They’re full of snails, kelp, and other interesting tidbits (like dead crabs)….not as colorful and exotic as the spectacular orange and purple starfish in the pools off the Oregon coast, but still fun. Milo towed his boat through the canals for a bit. Thumbs up Omi and Milo! Jeremiah’s dutifully being the daddy today, carrying Naomi. 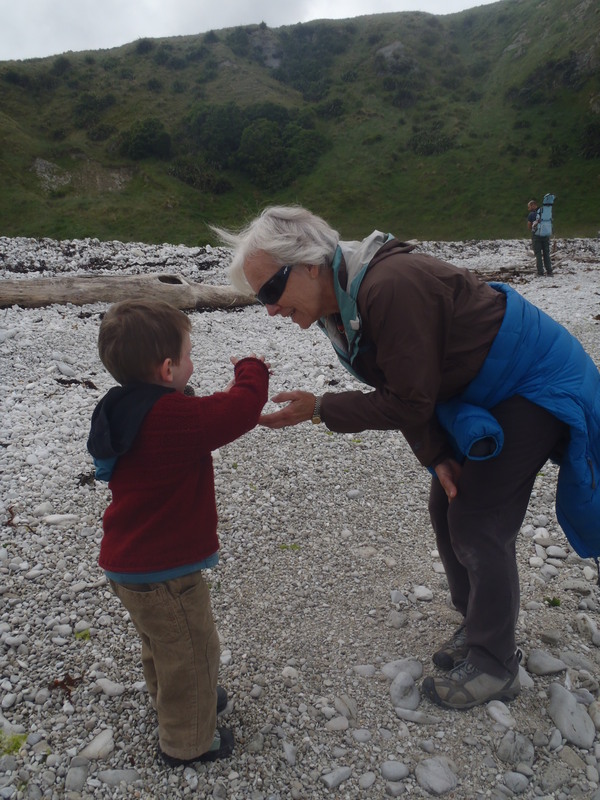 There were lots of black wet-suit clad guys dart fishing and collecting paua and crayfish (we’d call them lobsters without the big claws), and Jeremiah watched them enviously. Free diving isn’t really a family activity and it takes a lot of gear, but he’d sure like to get into it. Kaikoura is known for its seal colony. “Stinky seals” Milo says, wrinkling his nose and waving his fingers in front of it. They surely are stinky! They emit a rank odor of feces, and you smell them before you see them. They were lazing about like giant slugs on these rocks, with the red-legged gulls nesting above. Handsome birds, but they have horrible manners and cranky voices. I could spend hours beach combing, finding intricate sea urchin shells and bright orange crayfish legs to clutter up the shelves of our house. We stayed overnight at this little hotel and Milo took it upon himself to sweep the driveway in the morning. He does like a project! A former sheep farm on the peninsula has switched gears to agrotourism, in this case twice-daily sheep shearing demonstrations. Pete wears a shirt declaring “Two a day,” as opposed to the typical professional’s 400 sheep-per-day or the record holder’s 800-something per day (that’s one every 37 seconds, if you can imagine that). We contributed to the local economy by taking in Pete’s spiel, complete with multiple photo ops. Here Pete is shearing a Drysdale sheep, the breed that grows so much wool that it has to be shorn twice a year. One of the photo ops was with a pair of ram horns from a Drysdale sheep. Another photo op was with a 5 day old lamb. I’m impressed with how capable a lamb is after only 5 days of life outside, as compared to Naomi. Milo likes a project-made me laugh (I wonder who he takes after. We’re still thankful for all your priming of our third floor!) Sounds like a wonderful weekend in your NZed world. All the beautiful, happy smiles speak volumes. Where Milo gets the project gene probably has two answers….pick either parent!